Source: University of Maryland School of Public Policy. This month 181 graduate students from 93 institutions put their systems thinking into action during a first-of-its-kind competition. 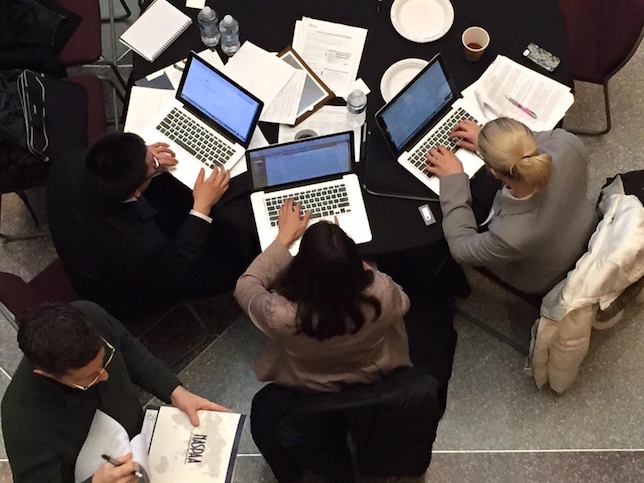 The Network of Schools of Public Policy, Affairs, and Administration (NASPAA) hosted a simulation contest in which participants were given a problem involving current health care policy that lawmakers are facing. Their job was to apply skills learned in the classroom to develop a real-world solution that took into account intervention tactics, stakeholder needs and financial models. The goal of the event, which took place at six regional locations around the country, was to encourage the students to implement systems thinking and show off skills that will help their employability in the job market. The competition used an analytical computer tool from ReThink Health that simulates the behavior of a regional health system. The health model can be customized with data reflecting the situation in an individual region to help public administrators understand the range of trade-offs they face in the course of their decision-making. The same model is also being used in academic programs to train students. "The progression of public service education and the advances in technology will further enable public servants to be competitive with their business school counterparts while augmenting their classroom experiences," said Executive Director Laurel McFarland. "The competition will spur dialog about how the system can be improved, and provide a unique learning environment for these students, our future public policy leaders." Because of the complexity of public problems, schools teaching those programs have increasingly turned to simulation work in their curriculum to give students practice in understanding, analyzing and resolving big issues. NASPAA host the event to help educators supplement what they're doing in their public service courses and to showcase the capabilities of the students pursuing the field. Winners in the regional and national competition received unique prizes: the chance to shadow a federal official for a day; and the opportunity to meet with state legislators. "We are poised to create a new generation of policy leaders who understand better how the health system works and who will not be content with quick fixes. They will resist partial reforms that are doomed to rebound and instead invest in sound strategies that will steer our health system in new, more sustainable directions," noted Bobby Milstein, a judge for the event and director of Rethink Health.